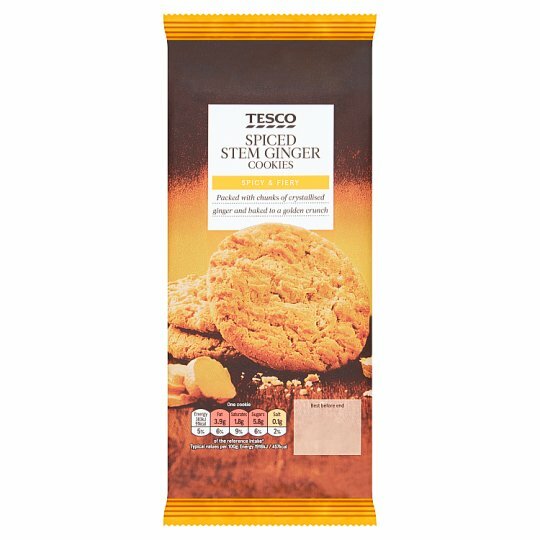 10 Ginger flavoured cookies with crystallised ginger and stem ginger pieces. Wheat Flour (Wheat Flour, Calcium Carbonate, Iron, Niacin, Thiamin), Sugar, Palm Oil, Rolled Oats, Crystallised Ginger (6%), Stem Ginger (6%), Cornflour, Dried Skimmed Milk, Invert Sugar Syrup, Raising Agents (Sodium Bicarbonate, Ammonium Bicarbonate, Disodium Diphosphate), Ginger Powder, Molasses, Flavouring, Emulsifier (Soya Lecithins). Crystallised Ginger contains: Ginger, Cane Sugar. Stem Ginger contains: Ginger, Cane Sugar.